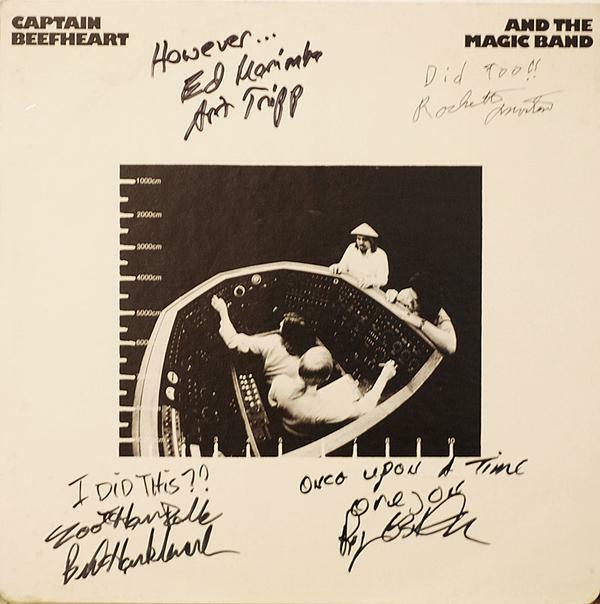 A number of Captain Beefheart and Frank Zappa albums and CDs have been donated for a charity raffle and signed by some of the musicians who recorded them. The raffle is in aid of the Animal Rescue Foundation (ARF). Kitty Tripp, organiser of the raffle, says that among those who have donated so far are John French (Drumbo), Mark Boston (Rockette Morton), Cal Schenkel, Bill Harkleroad (Zoot Horn Rollo), Denny Walley, Roy Estrada (Orejón), Jimmy Carl Black, Ed Mann and, of course, Art Tripp (Ed Marimba himself). There is no quality grading of the items to be won, so expect vinyl to be well played and CDs to have been opened for signing. Tickets cost $5.00 each and can be bought through PayPal. The draw takes place on August 25 at Satori in Mobile , AL . Ticket holders are invited to attend. Winners who cannot be present will be sent their prizes. Full details are at satoriarf’s myspace page. Thanks, guys- we’ve already had a great response! I’ll be posting photos of the finished albums as they come in- so far my favorite is Clear Spot. It looks fab with all the signatures under a clear sleeve. ARF really appreciates the plug! Last update… and not even Beefheart related. Bunk Gardner has autographed the Mothers albums increasing the swellness factor exponentially. Thanks to the people on the Beefheart site for letting us pimp the raffle, and thanks to those of you have bought tickets. We’re closing up paypal shopping on the 23rd. Good luck- I hope someone on here wins some of these albums! Thanks to everyone who participated in any way to the great fundraiser we had Saturday night. Together we raised over a thousand dollars for the Animal Rescue Foundation- and even recruited a few new volunteers! We’ve still got one prize being auctioned off- a last minute donation by Cal Schenkel will bring our fundraising total even higher. Here’s a list of winners- if you haven’t received your email notice please get in touch with me so I can send your prize on it’s merry way to you! Congrats to Mike Smith, Jessica Lauren, “Hangnalias”, Jeff Economy, Roger Hamilton, Arthur P of Mobile, Joe Martinelli, Cindy Fournier, Heath Underwood and Mary K of Gulfport. MS. Most of you already know what you won but if you don’t please contact me so I can make sure I have your correct mailing address. We’ll mail the prizes out this week! Again, thank you so much- to everyone who bought tickets- to all the great musicians who made it fun night- and to the members of the Magic Band and the Mothers/Zappa bands who so generously donated their music and signatures to a very worthy cause. ARF!